We often hear rumors of future expansions and updates for games found through leaks, and this time it's Rocket League's turn to be data-mined. A few days ago, a clever Redditor posted an image he found while rummaging around in game files and it didn't take long for discussions to run wild on the Rocket League Subreddit. After a few days, Psyonix Vice President, Jeremy Dunham, jumped in with a post to confirm that crates and keys are indeed part of their plans for the future. This news was supposed to be released at The Rocket League Championship Series finals, which are scheduled for August 6-7, but "since this image came out before our official word, we wanted to clarify some things for you." Due to the obvious similarities between this crate and key, and the famous CS:GO cases, the community started to speculate in possibilities for money making and comments were made on how gambling was a very disappointing move from an otherwise popular and player friendly developer. However, Dunham was quick to debunk those theories, as Rocket League crates and their corresponding keys are meant to help fund future eSports prize pools and events, and nothing else. They will not be tradeable on the Steam market at all, and Dunham has a very good explanation as to why: "There will be no Steam Marketplace integration with crates. We are definitely aware of the problems related to third-party gambling in other games and we are not interested in taking that approach." In his post, Dunham made sure to specify that the content of the crates will have no effect on gameplay. They will contain cosmetic items only, as per Psyonix' "Don't Sell Advantage" policy, which they are sticking to. That is pretty much all we know, whether or not they will have unique drops was not mentioned either, but that is something we can expect. There has to be some incentive to use real-life money on what will drop in-game anyway. Players can choose not to have anything to do with this part of the game at all if they wish, there will be an option to hide it entirely. 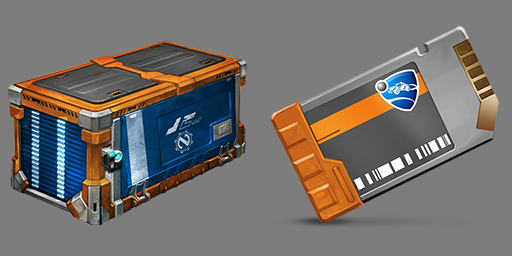 Further details on how to acquire crates and keys were not discussed, however, it is reasonable to believe that cases will drop at the end of a match, and the keys needed to open them can be bought for real money, just like in other games using this feature. We will have to wait until next month to find out how this actually will work, and how much it is going to cost, so stay tuned if you are interested in a new way of collecting fancy customization for your cars. HaLoAcE, Harrrry, Feyfolken and 4 others like this.